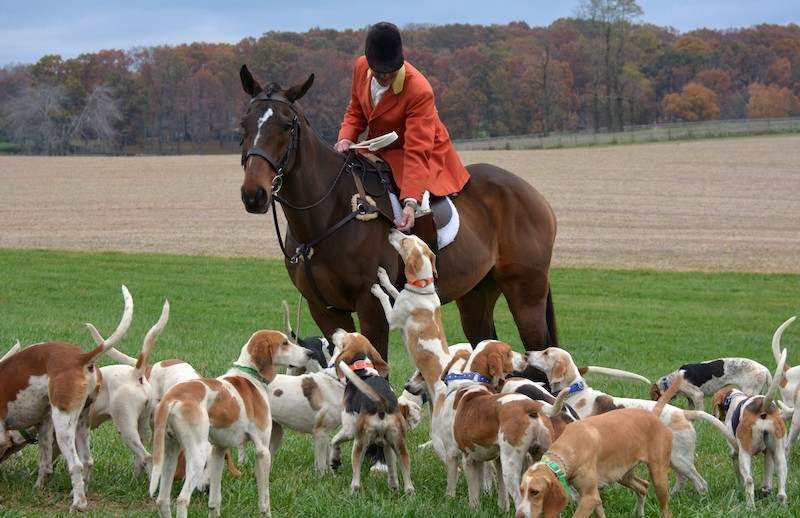 English Foxhound: Stag hunting was once the sport of Britain’s landed gentry but when stag became scarce, they turned to pursuing the more abundant fox. The farmers’ hounds that were first used were reliable but slow and not suited to working with hunters on horseback. Early hunters wanted a hound with a keen nose, sound paws, speed, enthusiasm and stamina. By selective breeding, hounds were created to meet their demands. The first kennel specializing in these hounds dates to 1696; by 1750 there were 50 Foxhound kennels in England. The symmetry of the Foxhound is of the greatest importance, and what is known as “quality” is highly regarded by all good judges. 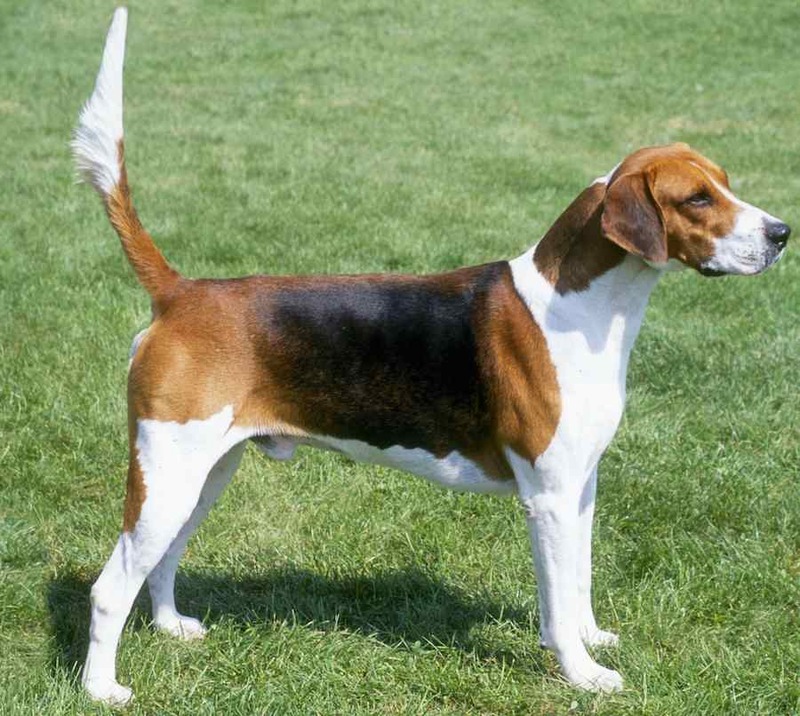 Coat and Colour: The English Foxhound coat and colour are not regarded as very important, so long as they are a good “hound colour” and the coat is short, dense, hard, and glossy. Hound colours are black, tan and white or any combination of these three, also the various “pies” compounded of white and the colour of the hare and badger, or yellow, or tan. Head: Should be of full size, but by no means heavy. Brow pronounced, but not high or sharp. There should be a good length and breadth, sufficient to give in a dog hound a girth in front of the ears of fully 16 inches (41 cm). The nose should be long, 4-1/2 inches (11 cm) and wide, with open nostrils. The teeth must meet squarely. Ears set on low and lying close to the cheeks. Most English hounds are “rounded” which means that about 1-1/2 inches (4 cm) is taken off the end of the ear. Neck: Must be long and clean, without the slightest throatiness, not less than 10 inches (25 cm) from cranium to shoulder. It should taper nicely from shoulders to head, and the upper outline should be slightly convex. Forequarters: Shoulders should be long and well clothed with muscle, without being heavy, especially at the points. They must be well sloped, and the true arm between the front and the elbow must be long and muscular, but free from fat or lumber. Elbows set quite straight, and neither turned in nor out are essentially required. They must be well let down by means of the long true arm above mentioned. Every Master of Foxhounds insists on legs as straight as a post, and as strong; size of bone at the ankle being especially regarded as all important. 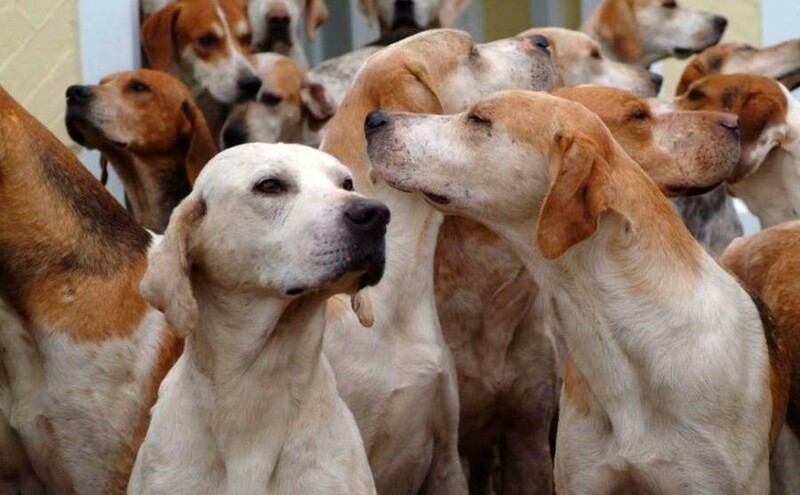 The desire for straightness had a tendency to produce knuckling-over, which at one time was countenanced, but in recent years this defect has been eradicated by careful breeding and intelligent adjudication, and one sees very little of this trouble in the best modern Foxhounds. The bone cannot be too large, and the feet, in all cases, should be round and cat-like, with well developed knuckles and strong horn, which last is of the greatest importance. Body: The topline of the back should be absolutely level. The chest should girth over 31 inches (79 cm) in a 24 inches (61 cm) hound, and the back ribs must be very deep. Back and loin must both be very muscular, running into each other without any contraction between them. The couples must be wide, even to raggedness. Hindquarters: Hindquarters or propellers are required to be very strong, and as endurance is of even greater consequence than speed, straight stifles are preferred to those much bent as in a Greyhound. Tail: The stern should be well set on and carried gaily but not in any case curved over the back like a squirrel’s tail. The end should taper to a point and there should be a fringe of hair below. Disqualification: Pig-mouth (overshot) or undershot. Link: English Foxhound on wikipedia.